We will explore each of those in turn. None basically means that we fall back to the transaction semantics that we use in the database. The database may throw us out, but aside from that, we don’t really care much about things. Note that we have so specify dynamic-update to true. This is required because doing so will generally cause much greater number of query plan to exist in the database cache. If the update fails because the row was updated, we will get a StaleObjectException. Like all exceptions, this will make the session ineligible for use, and you would have to create a new session to handle it. As you can probably guess, if the version doesn’t match, we will get StaleObjectException. This is, of course, a less safe way of doing things, and I recommend that you would use a numeric value instead. Another option is to use the database facilities to handle that. in MS SQL Server, this is the TimeStamp column, which is a 8 byte binary that is changed any time that the row is updated. We use the value of the timestamp to ensure that we aren’t overwriting the row data after it was changed. The database will ensure that the row timestamp will change whenever the row itself is updated. This plays well with system where you may need to update the underlying tables outside of NHibernate. Pessimistic concurrency is also expose with NHibernate, by using the overloads that takes a LockMode. 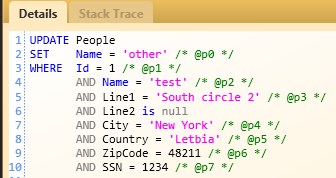 This is done in a database independent way, using each database facilities and syntax. The behavior for conflict in this case is very simple, we wait. If we wait for too long, the timeout will expire and we will get a timeout exception, because we could not obtain the lock. That is consistent with how we would use pessimistic concurrency elsewhere. To me, there are not four but three concurrency models - optimistic, pessimistic and none. "Versioned" is just an impl detail of opt concurrency. That is just how it is shown in the profiler. The database gets the actual timestamp value, which is binary. You can say that, yes, but there is a distinct difference in the behavior of optimistic vs. version. Thanks for this series of post. This is much betther than the nhibernate documentation. don't rely on the documentation for an in depth understanding of NHibernate get the book Nhibernate in action. I tried to implement optimistic locking using the timestamp column today, but I'm having some trouble with deletes. 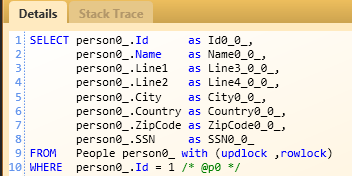 Before optimistic locking, I was able to simply create a new POCO object, with only the id properties filled in and then call session.Delete(theObject) and NHibernate would perform a simple "DELETE FROM .... WHERE Id = ...."
What you are doing is a pretty nasty trick, and as a matter of fact, it probably would stop working at some point. The problem is that what you are doing circumvent the cascade and delete behavior that NHibernate has. Consider it a bug that it works. I guess I'll have an elaborate look at the way NHibernate works with it's first and second level cache and how session work in detail. What if I want to save the history of the changes? So, instead of update the row, I want to insert a new row with the new data and version. NHibernate, I think, should check (like you showed in the post) that the row with the higher version (the last inserted) is 'version - 1'. Thank you very much for this serie of posts. It's helping me a lot. If that is the case, you need to do this yourself. You can extend NHibernate to do just that , by using the listeners architecture. But I'm a little confused. Also having read the NHibernate docs, I tried to use the version-element in my mapping, but its not in the schema of the version I use, which is "urn:nhibernate-mapping-2.2"/ NHibernate 2.0.1. Are the docs not in sync with the software or am I missing sth.??? The location of the version is important, it should be just after it id. having added the version-tag now in the right place, I get a database error when saving a loaded object. I manually do a saveOrUpdate on a referenced child object (a localized text entity), but having configured the version-tag for each entity (the parent and the child) the saveOrUpdate now does an insert and causes a unique key constraint violation. I don't know, why there is this insert statement now. Either I would expect an update or a delete and a following insert. In the latter case, the insert should work because the old row with the same unique key should have been deleted. What am i missing? How does the version affect the saveOrUpdate() method? I thought, it would just check the value of the version column and increment it upon update (if not stale). Please use nhusers for support, I can't figure out what the problem is. Ok, I could figure it out for myself. Problem was that the version number of my entity was set to 0 and I didn't explicitely specify a "unsaved-value" which by default also was 0. Thus, NHibernate was quite right to try an insert. My fault. As you can see, it's identical to what you have above. Are you using yours together with a custom IUserVersionType? I thought binary blob implemented IVersionType. It seems that for some reason, NHibernate is interpreting the Version property as dirty immediately after reading it from the database and thus attempts to do an update. I using NH 2.1 Alpha2. I posted to nhusers and, getting no response, tried stackoverflow and finally your blog. Is it possible to use dynamic insert /update with versioning? I'm trying to do this with Oracle and when I update a column, the generated SQL tries to update the version column (ORA_ROWSCN). I have seen a post on stackoverflow that says the same thing happens with SQL Server timestamps. if you are using NHibernate.Mapping.Attributes, [Column(...)] attribute is ignored under [Version] attribute. Workaround is to use [RawXml] to specify appropriate mapping. 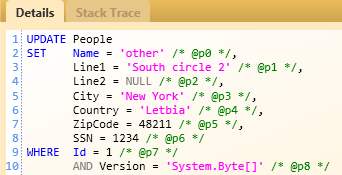 Not sure whether it was already fixed in latest versions of NHibernate.Mapping.Attributes though.